The finance-troubled shipbuilder Daewoo Shipbuilding & Marine Engineering (DSME) will receive a new bailout tranche worth 6 billion USD, after the local high court rejected the appeal from a group of individual investors and removed the last stumbling block for a fresh debt relief. According to the local media Pulse News, the government-led bailout package required all creditors and bondholders to agree to push back the maturity, lower borrowing rates, and convert debt into equity according to their share, but was put on hold after some of the individual investors appealed to a Busan court, disagreeing with the decision. 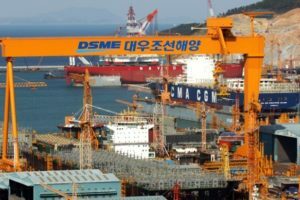 The rescheduling scheme was released and following the transaction half of the DSME’s existing debt would be converted into equity, pushing down the debt ratio to 300%, compared to 2,732% at the end of 2016. The shipbuilder will receive fresh funding of 2.9 trillion KRW (2.6 billion USD) pledged by state lenders and rescheduling in existing 3.9 trillion KRW (3.5 billion USD) debt through debt-to-equity swap. The transaction is important for DSME, as without it the shipbuilding will not be able to redeem 940 billion KRW (0.8 billion USD) in corporate bonds maturing this year. The shipbuilder’s largest shareholder Korea Development Bank (KDB) had offered refund guarantee on the order of 250 million USD that DSME won on April 4 to build three very large crude-oil carriers (VLCCs) from Maran Tankers Management, a subsidiary of Greek shipping giant Angelicoussis Shipping Group. The private lenders would guarantee future orders.